I purchased my DipBrow back in the summer of 2014. The hype surrounding this product was insane. Other companies have now come out with their versions of brow gel pomades (such as Illamasqua and NYX). Although, to be fair, the first brand to come out with a product like this (to my knowledge) was MAC in 2012 with their Fluidline Brow Gelcreme. The problem with MAC’s was that it was initially a limited edition release and most of the colors ran warm/red toned. Back to Anastasia… I wanted to review this long ago but I kept forgetting. It has become such a necessity staple in my routine that using it is simply second nature. I’ve also included a mini eyebrow routine in case you were curious. + The texture is creamy and it glides on easily across the skin. + The product is really pigmented (specially during the first few months) so a light-handed application is advised. You don’t need much product. + A jar can last you ages. I’ve been using mine almost every day for 6 months and I still have 75% of product left. + It will dry out and change texture overtime. My Dipbrow is definitely more dry than when I first bought it. This is a natural side effect of gel products (specially ones you use frequently because you are opening them often and exposing them to air). I’ve seen several methods that can “fix” or revive your Dipbrow online but have not tried them myself as I don’t feel mine needs it yet. Some might prefer the drier texture because it’s easier to work with (not as intensely pigmented from the start, better for more natural brows). I’ve noticed that I need a bit more product to achieve the same pigmentation/intensity now that it’s drier as opposed to when it was brand new. Even so, I don’t see myself running out of product anytime soon. + You can achieve a natural or dramatic brow depending on the brush and the amount of product you use. + One peculiar fact about the Anastasia Dipbrow is that it used to break me out (cause blemishes around my eyebrows) during my first month of use. A friend of mine also had this experience. We kept using it because we loved it so much. It hasn’t caused any blemishes since. + The Dipbrow gives me sharper, cleaner edges (because of its texture and the fact that it must be applied with a brush). + The Dipbrow Pomade is really long-lasting. It wears longer than any powder or brow pencil I’ve used in the past. + The shade range is phenomenal! There are many shades in both warm and cool undertones to suit any hair color. 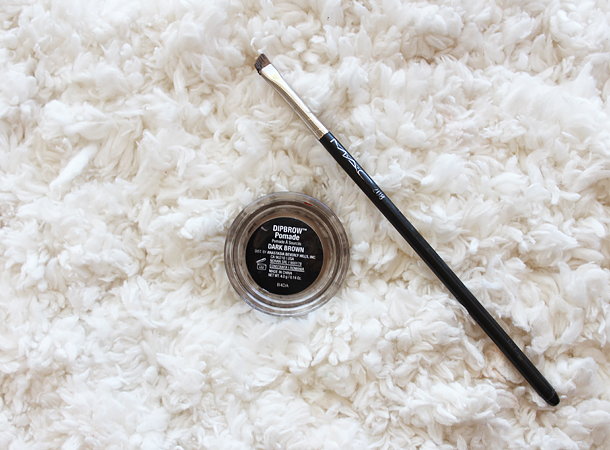 I tested so many brushes until I found my favorite one to use with my Dipbrow and it’s the MAC 208 Small Angled Brow Brush. I love it because it’s small, precise, and dense. Brush preferences are very personal but I highly recommend the 208. It’s expensive but a great investment. It holds up to constant use and abuse like a champ. Finally, to wrap this up, here is my mini eyebrow routine. I’ve had the same eyebrow shape since I was in high school. I like it a lot so I try not to let my brows grow too hairy in order not to lose it. Image 1: My messy hairy brows. I try not to let them grow out this much but didn’t have time to get them done sooner. Looks gross but just keepin’ it real. Image 2: My brows after they have been threaded. I used to wax them but converted to threading because my skin was reacting very badly to wax. Plus, I find threading more precise so there’s less chance of getting an overly thin brow. In between threading sessions I pluck stray hairs with tweezers. Image 3: My brows after they have been filled in with the Anastasia Dipbrow Pomade in Dark Brown using the MAC 208 brush. I will shape them naturally or dramatically depending on whether it’s daytime or nighttime. Sounds so amazing – I really want to try it! I love the clean cut brow you can achieve with it. I have been using a Clinique gel eyeliner in a brown/taupe shade and it actually works quite well! The result is looking amazingly natural ! I need to give it a try ! Great review, Coco! I got this product (Medium Brown) in January and all of my other brow products have gone unused since. I love it so so so much! I recently got my brows shaped at Anastasia and they used a different colour than what I had and it was way too warm for me. I'll always go back to my Medium Brown! I also really love the brush they sell with it – the brush part is excellent and having the spoolie on the other end is unbelievably handy! Oh wow your brows look amazing! I've never had anything professional done with my brows but now I want them threaded and I want to try DipBrow! Your brows are gorgeous! I feel like I have to keep my natural brows on the thinner side because of the way I like to apply my dipbrow for a full look without looking too bold, haha. I like the Anastasia #17 brush for eyebrows – it's double ended with an angled brush and a spoolie so it's easy for me to blend it out. When I first got the brush I didn't have a proper brush for eyeliner so I would use that one, and on some days I forgot that I used black gel liner the day before so I ended up with really black brows lol. Oh my gosh. That happened to me once. I was like "why are my brows so dark and sharpie like?" and I had forgotten I'd used the brush for liner. You have such gorgeous brows <3 I began using this not too long ago and it has also become a necessity in my routine. i love my dip brow! i do put powder on my brows after i use it though as it sets it well for me. i'm constantly looking for a new brow brush so i'll have to give the 208 a shot! I really need to try this, must be one of the only brow products I've missed! I love your brows! Mine have been looking crazy lately so I have to go back and have them threaded again. lol I've never tried the dipbrow pomade but I want to give it a go. It looks like a great product for the hot weather here. 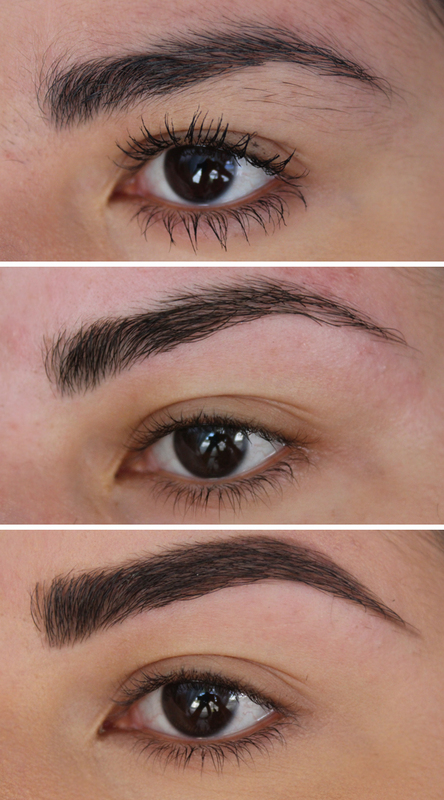 Oh my, even without filling in your brows, they look gorgeous! ahh yo tengo tambien..y es maravillosa….un producto que recomendo tambien! Your brows look great! I've been looking for a product to use on my brows, I need to try this. I love Dipbrow ever since I discovered it and have been using it everyday for almost a year. I was disappointed when I saw that it dried out at first, but now it's no big deal and I think I prefer it because it makes it easier to use! Your brows are so perfect. Mine are taking forever to grow back in sparse areas that I've plucked in my teenage years. It's such a pain. Dipbrow has definitely helped me fake it though. Such an amazing product. I have heard so many great things about this product – I need to get my hands on it! I wish my eyebrows looked like yours, they are amazing!